I often get this from my children – usually when I go overboard about a particular ingredient or get excited about a certain chef and what they are cooking. They have a deep fear – like I suspect most children have (I know I did) – that they won’t fit in, that they are not like all the others and that they might stand out from the crowd. And god forbid it might be because of the parent – me! Growing up the child of Alice Waters I suspect her daughter Fanny felt this sometimes, if not often. At the moments where school and home life intersect there is the most risk which is particularly relevant with lunch boxes. 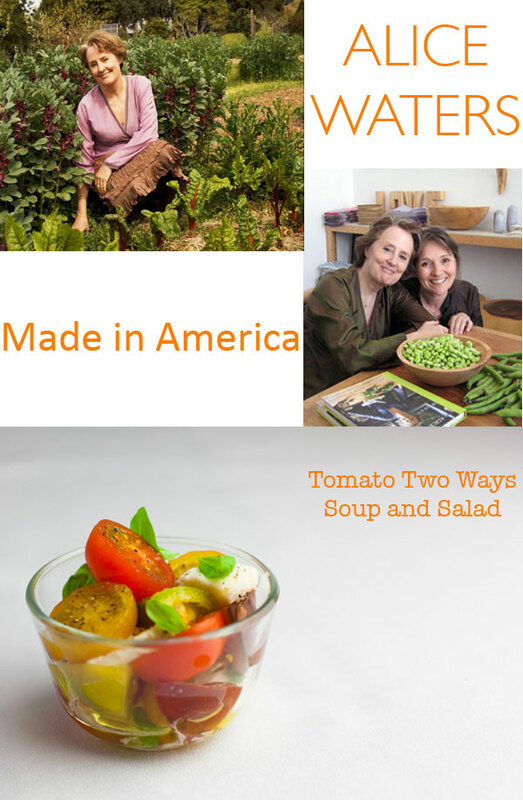 Alice Waters talked about sending Fanny to school with a tomato and mozzarella salad – not unlike the recipe she gave to me for Made in America. I often do a similar salad for Minty who is a huge fan. No huge red alerts with this one – it’s almost ‘normal’ these days to have a caprese salad – even in a lunch box it seems. 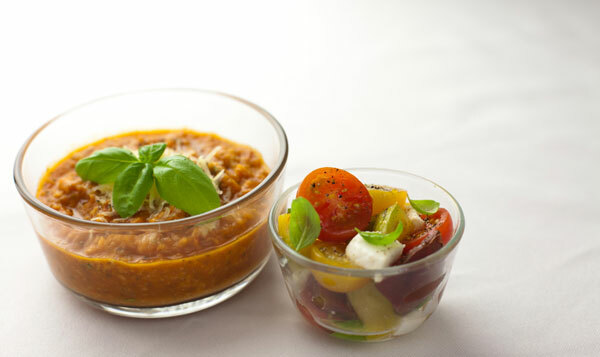 As Minty and I looked through the proofs of Made in America together she recognized many dishes she’d eaten along the way – the tomato soup and salad combo was a particularly fond memory – the salad went to school in her lunch box. As a son of a chef my husband says he developed a reputation amongst his peers for his extravagant lunches and that he always felt sorry for other kids with their peanut butter and jelly sandwiches. His was a lunch box of foie gras and veal scallopini from La Côte Basque – always served with a large number of condiments. On one occassion the chef-son’s-La-Côte-Basque-lunch-box pushed the lunch room over the edge. Quietly eating his lunch, the lunch room supervisor shouts across the room “Rachou, what is that smell?” It turns out the smoked mackerel he was eating – a whole fish – was just a little too fishy for his fellow school cafeteria diners. Fanny’s was a larger than usual lunch box full of fresh salads and seasonal delicacies from Chez Panisse. Wolfgang Puck told me his son was going to school with the lobster and ginger sauce from Chinois on Main. Oh to be Fanny at Chez Panisse – one of our favorite books, Fanny at Chez Panisse: A Child’s Restaurant Adventures with 46 Recipes . It’s time to watch Marcel Pagnol movies – the inspiration for the name Chez Panisse and Fanny. Chez Panisse is 40 this year – and there will be a series of celebrations. You can purchase tickets to join the fun through One Kings Lane. For example if you have $15,000 spare and want to spend a day in the kitchen at Chez Panisse now is your chance. You can also donate directly to the Chez Panisse Foundation. Chances are if your local school has a schoolyard garden it was probably inspired by Alice and her Edible Schoolyard: A Universal Idea. Here’s a video I made with Todd and Diane the White on Rice Couple in the Garden School Foundation 24th Street Schoolyard Garden here in Los Angeles. Let’s get all kids a garden to play in, grow vegetables and cook from – my favorite quote is the kid who says that the fresh mint smells like gum! 24th St. Garden School from Lucy Lean on Vimeo. This is a wonderful book you’re working on, I can’t wait to see it when it comes out this fall! Count me in for the fun…just charged $15,000 to my Platinum card. I wish!! I am a mom like you gals – get waaay excited about ingredients, always. Alice is yet another reason to rush out for your FABULOUS book when it hits the shelves. Oh so glad you have put your Platinum Card to good use!